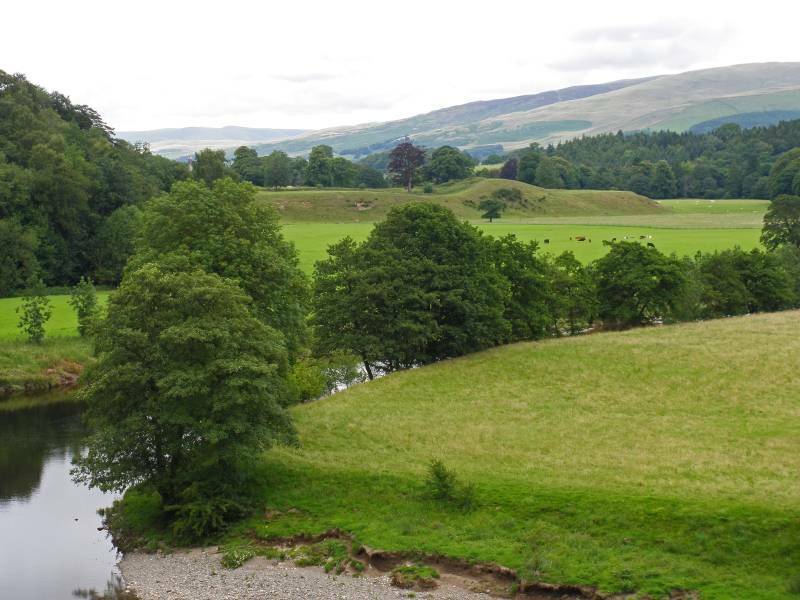 Ruskin's View to Devil's Bridge. Route. 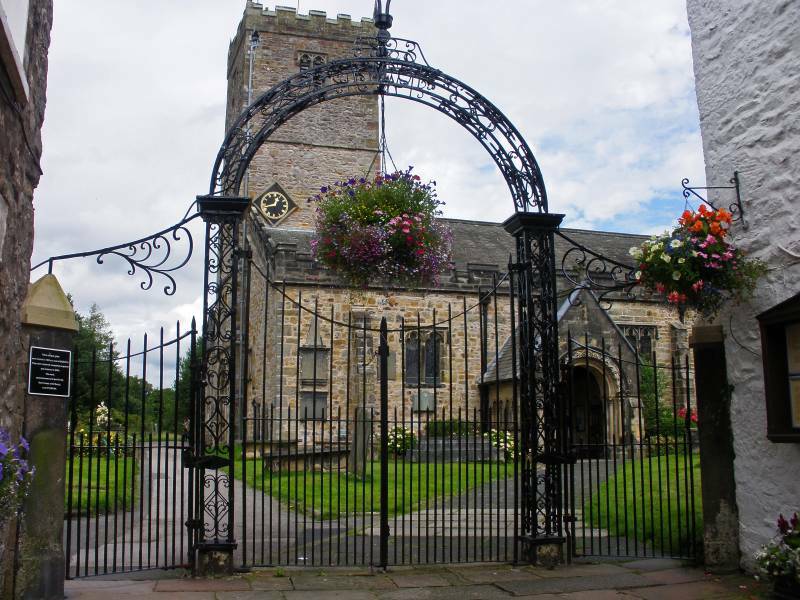 Kirkby Lonsdale (Market Place) - Main Street - Church Street - St Mary's Church - Ruskin's View - River Lune - Devil's Bridge - Kirkby Lonsdale. Notes. 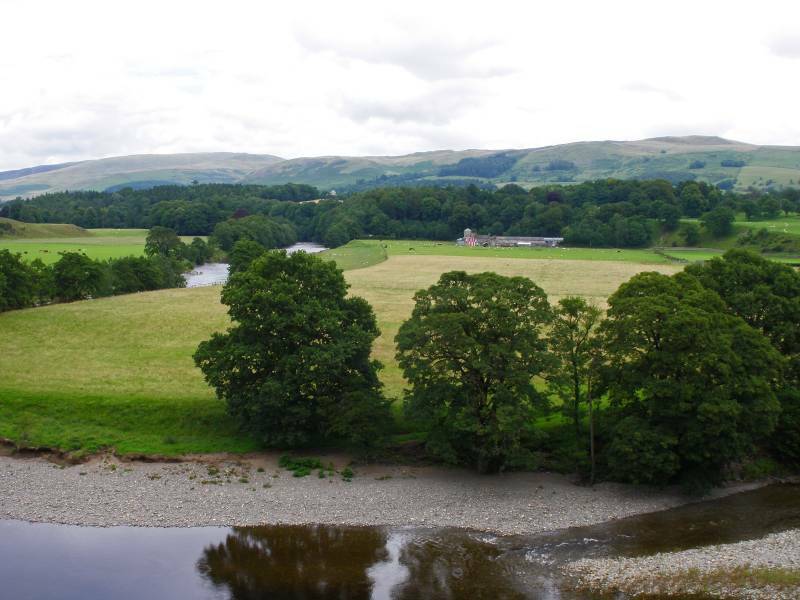 I was in Kirkby Lonsdale this morning, an ideal opportunity to visit Ruskin's View, so with Sue and a compact camera for company we visited the said view point, followed by a short walk along the banks of the meandering River Lune. 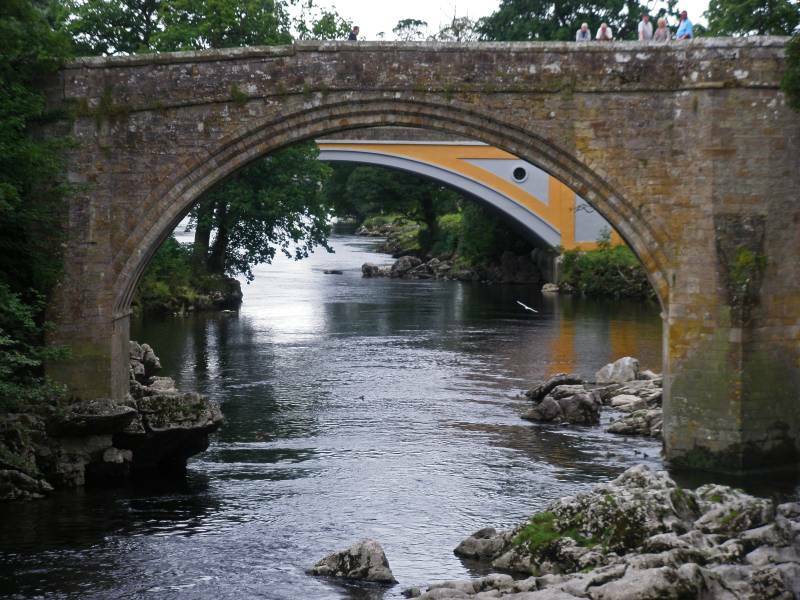 This is an ideal after dinner walk or before breakfast wander if you prefer the quiet, as Devil's Bridge does get rather busy. 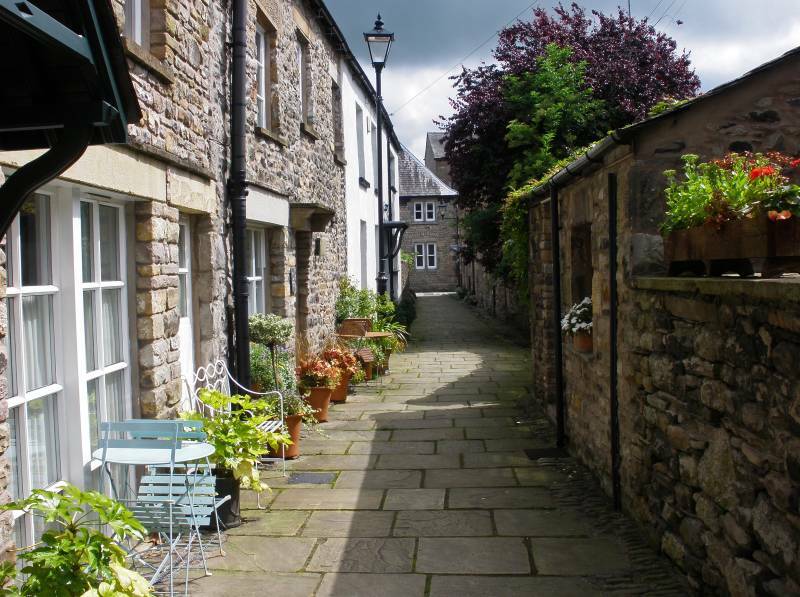 We parked in Market Place from where it was a short walk along Main Street to the Church of St Mary, the path to Ruskin's View was clearly marked guiding us between grit stone and limestone head stones. 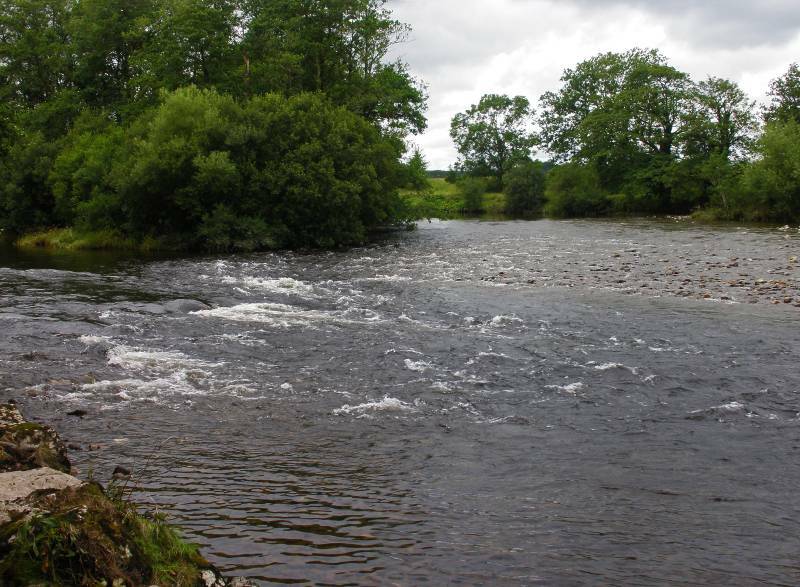 After admiring the view Ruskin so eulogized over we descended a flight of steep steps to reach the river. 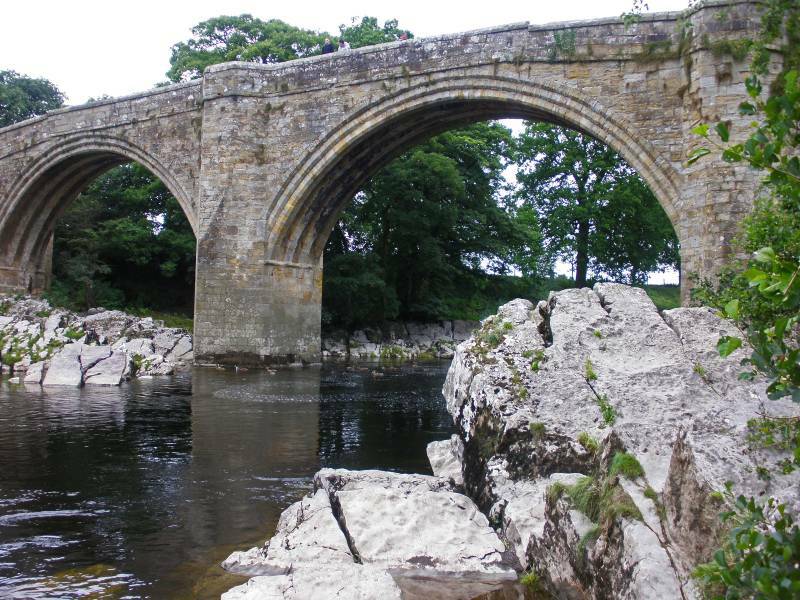 A short walk south along the banks of the River Lune followed before reaching the crowds and the unmistakable triple arches of Devil's Bridge. After spending a few minutes admiring the graceful arches said to have been constructed by Satan himself, we made our way up the road passing the toilet block to reach a tarmac path on our right, this guided us back to Market Place and the waiting car. Found just off Main Street, Salt Pie Lane formally known as "Cattle Market Yard" re-named in 1911 after one of the residents was so famed for making hot salted mutton pies. Dating back to Norman times, St Mary's Church. Ruskin's View painted by Turner, famously described by the Victorian artist and critic John Ruskin as one of the finest views in the country. 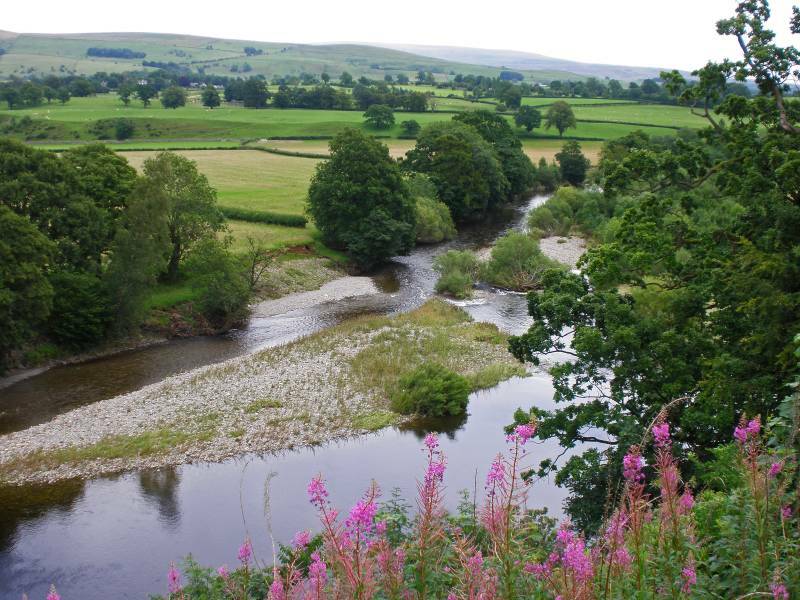 Views over the River Lune to Ireby and Leck Fells. And again from Ruskin's View, Middleton and Barbon High Fells. 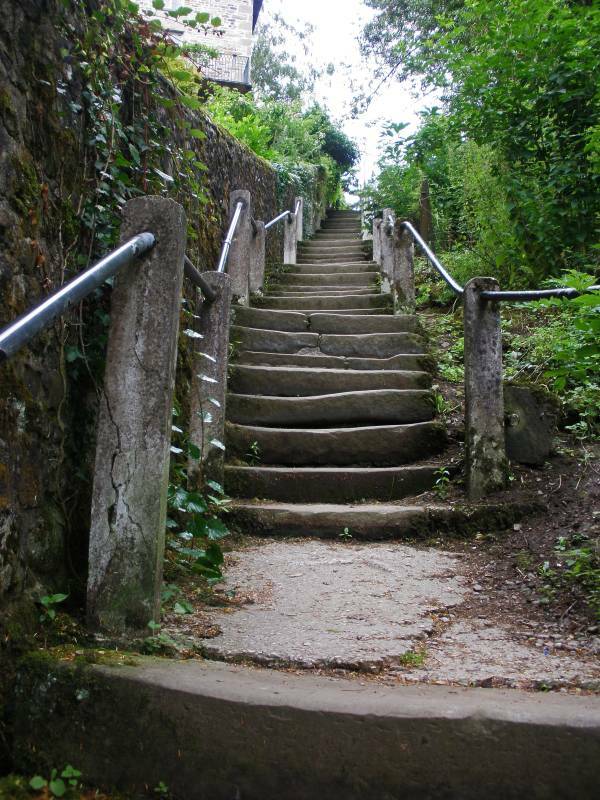 We left the view point via this flight of well worn steps. 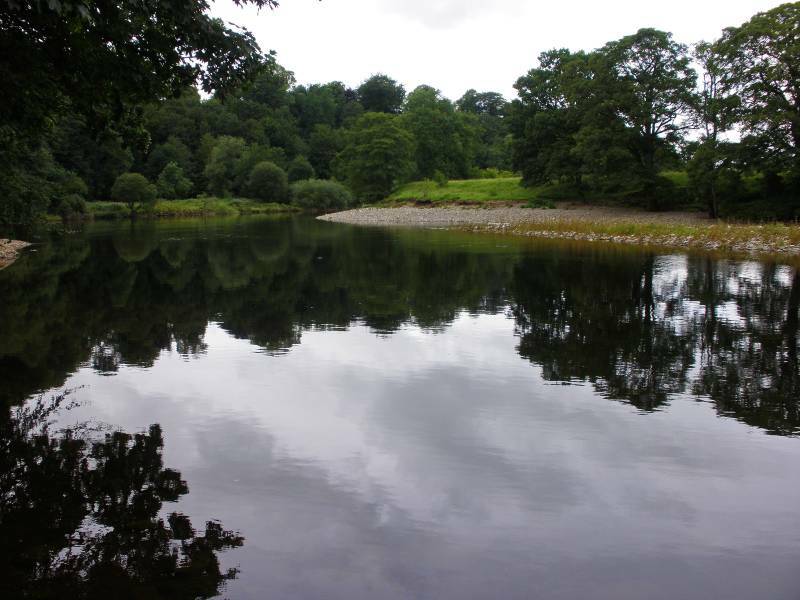 The River Lune below Ruskin's View. 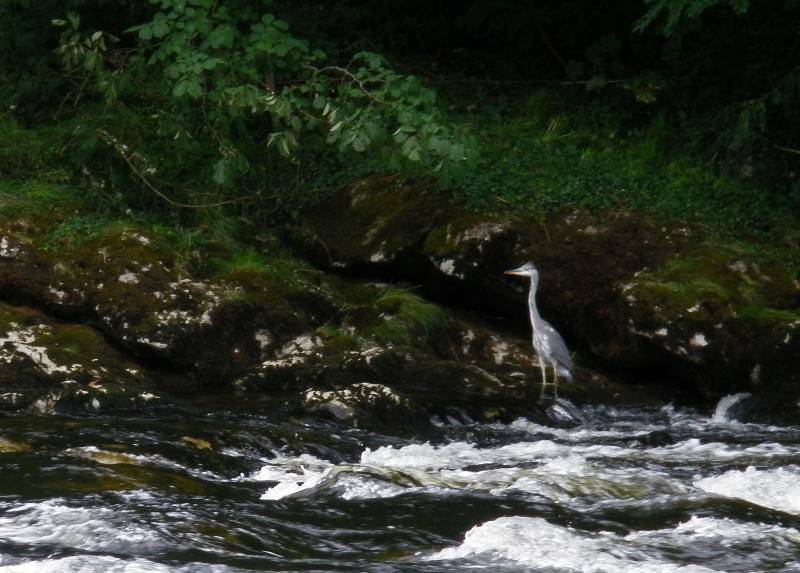 A few hundred yards up stream from Devil's Bridge a Heron eagerly awaits a late dinner. Devil's Bridge backed by a rather gaudy Stanley Bridge. Stanley Bridge built in 1932 to replace Devil's Bridge as the main river crossing, painted this ghastly colour about two months ago. 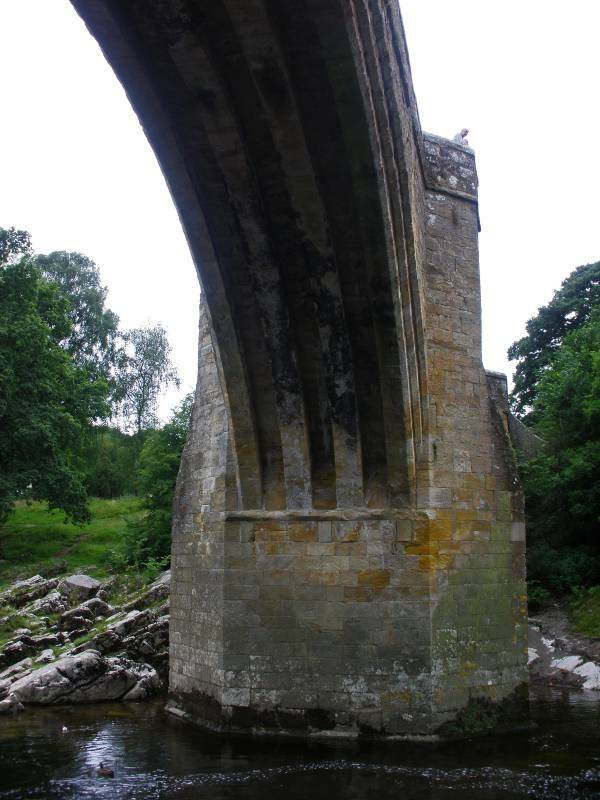 The graceful ribbed arches of Devil's Bridge, legend tells us the Devil appeared to an old woman promising to build a bridge in exchange for the first sole to cross it, when the bridge was finished the woman threw bread over the bridge, her dog chased after it thereby outwitting the Devil. 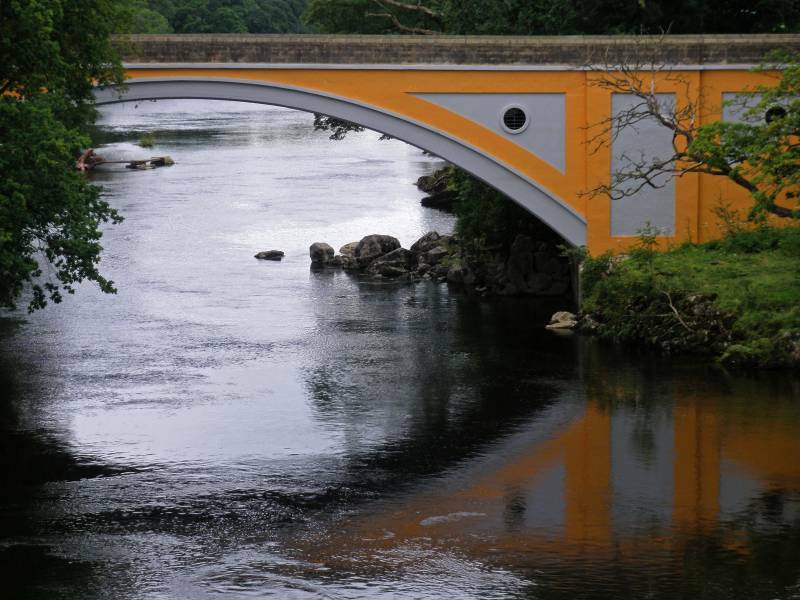 When I was a young lad many years ago now, we used to cycle from Kendal on hot summer days, our time was spent leaping from the bridge into the icy water of the river, a practice that has now been banned, if you lean over the bridge parapet it still may be possible to see a rather large three fingered hand indentation, said to have been left by left by Satan himself.